"I am an immigrant. My parents are immigrants. I represent a district filled with immigrants." A Texas lawmaker is making headlines after making an emotional speech to his colleagues, speaking out and opposing a bill banning "sanctuary city" policies. A video of his impassioned remarks has gone viral. 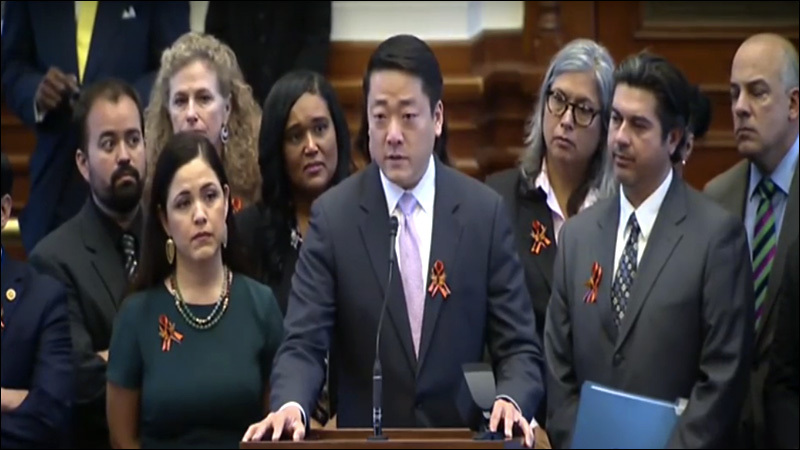 Rep. Gene Wu (D-TX) addressed the state's House of Representatives last Wednesday during a debate about Senate Bill 4, which would force law enforcement officials to cooperate with deportation efforts by threatening jail time among other punishments. It would also allow police to question the immigration status of anyone they stop, including children. Unfortunately, the bill was approved by the House the next day. But not before Wu, who represents District 137 in Houston, threw down and explained -- through tears -- why fighting the controversial immigration enforcement bill was such a painful, personal issue for him. "This topic is painful for me," said Wu, who is Chinese American. "I am an immigrant. My parents are immigrants. I represent a district filled with immigrants." Wu invoked the discriminatory policies of America's past, including the Chinese Exclusion Act of 1882, which restricted the immigration of Chinese immigration into the United States, and the unjust mass incarceration of Japanese American citizens during World War II. In both instances, "The people who voted for that, the people who supported that, thought they were doing the right thing," Wu said. After sixteen hours of debate, SB4 passed with a vote of 94-53 in the early morning hours on Thursday. Wu called the passage of the bill "a solution in search of a problem." "When I first spoke on this bill I couldn't stop thinking about my boys," Wu said in a statement. "This bill and other laws like it are a constant reminder that, despite being born in this nation, they will be seen as outsiders because of the way they look; that the law will treat them with suspicion; and they will have to fight just to be treated equally. I was reminded that this is not the first time laws were passed against immigrants based on fear and hatred. And, it will not be the last."